2016 was not a good year for the Arctic with the continued warming of the air and sea water, and diminishing sea ice. The National Oceanic and Atmospheric Administration on Tuesday released its Arctic Report Card for 2016. Jeremy Mathis is director of NOAA’s Arctic Research Program and an editor of the 106-page report. It was the warmest year on record for the Arctic where the average air temperature is increasing at twice the rate as the global average. This year was 6.3 degrees Fahrenheit hotter than 1900. Also, water temperatures in the Arctic were 9 degrees Fahrenheit higher than the recent average. Topping the list of the warmth’s cascading effects is this fall’s slow freeze-up and continued decline of the Arctic ice pack. The minimum Arctic sea ice extent in October tied for the second lowest since the beginning of satellite observations in 1979. 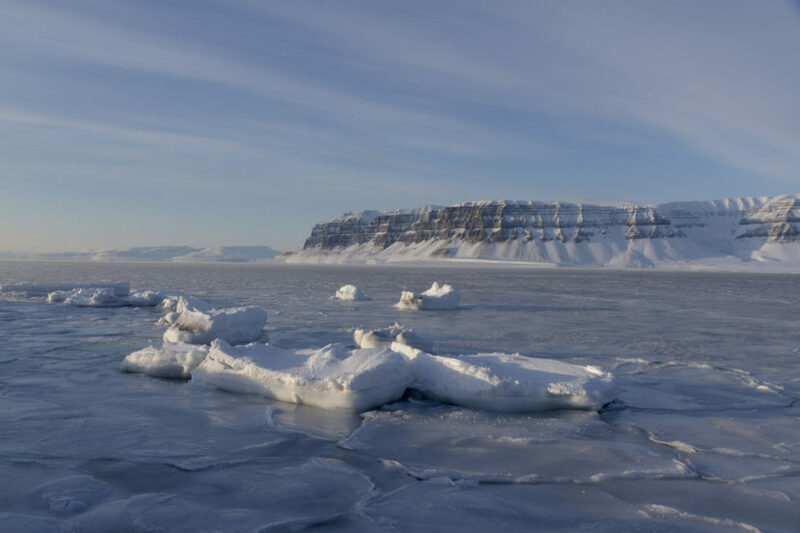 Thinner, more-fragile first-year ice now makes up the overwhelming majority of the Arctic ice pack, compared with 30 years ago when it was roughly a half-and-half mix with thicker, stronger, multi-year ice. Dartmouth College’s Donald Perovich, another of the report’s editors, said the Arctic ice pack could recover if temperatures cool. But he doesn’t think it’s likely. It’s hard to predict when the Arctic Ocean will be ice-free in the summer or what the Arctic will look like in 10 years. But Mathis said Arctic communities should be concerned about diminishing access to subsistence resources. Mathis said one positive aspect of less sea ice and earlier melting is that it stimulates more growth of phytoplankton, the base of the marine food web. The Arctic Report Card also notes a shrinking Greenland ice sheet, and spring snow cover dropped to a record low in the American and Canadian Arctic. Columbia University’s Marco Tedesco said the amount of snow melt affects hydropower production and fresh water reserves. Melting permafrost can also affect infrastructure development or construction in the far north. The warming, largely greening tundra is now releasing more carbon than it is taking in, and scientists are worried that the immense amounts of carbon stored in the melting permafrost could eventually be released and alter weather and climate around the globe. Williams doesn’t think it’s too late to take action on climate change. This is the 11th year for the Arctic Report Card, a peer-reviewed report sponsored by NOAA that includes the work of more 60 scientists from 11 countries. The findings were presented Tuesday at the annual meeting of the American Geophysical Union in San Francisco.